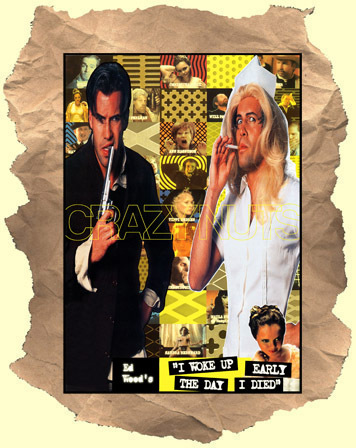 SYNOPSIS: Cult film maestro Ed Wood would have been thrilled at the bizarre cast pulled together for his unrealized script of I Woke Up Early the Day I Died. Everyone from old stars (Tippi Hedren), new stars (Christina Ricci), big (Billy Zane) and small (Max Perlich). Even a few from Ed Wood's original films (Vampira, Conrad Brooks). Billy Zane is at his wackiest in the lead role as an escaped mental patient who goes on a crime spree. He encounters an assorted group of oddball characters. What makes the film even more interesting is that there's no spoken dialogue!! There is sound: music, sound effects, grunting, etc. But nobody speaks! The film has a lot of Ed Wood type touches like stock footage, cheesy effects, surreal moments, overacting plus a little slapstick humor too. Recommended.